Longtime readers of this or any of my other blogs (Adventures in Weight Loss, Cooking and Life, Chicklets in the Kitchen) are likely to know one thing about me: I often don’t feel as if I have time to cook. No cooking, dishes or grocery shopping? Who in their right mind would turn down that pitch? The offer was doubly appealing because it hit my inbox in one of my “I really need to start eating more healthfully” moments. I have those feelings way too often. I clean up my diet for a day or two and then it’s back to the drive-thru, where I stuff my face with moderately tasty but definitely unhealthy meals. With a little luck, I thought FITzee meals could help me break that bad habit. I eagerly tracked my shipment, waiting for my freedom from cooking, dishes and unhealthy drive-thru food to arrive. Because I live in a house behind the main house, and my address has a 1/2 in it, the mail gets dropped at the big house. I had to make sure I knew when to walk up there and pick it up. Lucky for me, the box was bulky but not terribly heavy. I was able to wrangle it to my place without dropping it. Inside were 14 of FITzee’s small-sized meals, which contain 8 to 9.5 ounces of goodness. That might not sound like much food, but when the food is high-quality and nutrition-packed, you don’t need oversized portions to be satisfied. Surprise! I know I fall into the trap of thinking more is better—one of the many reasons I struggle with my weight. But for folks with bigger appetites, there are medium (11.5- to 15-ounce) and large (15- to 20-ounce) portions, too. After I unpacked the box (with two each of seven different meals), I dove right in to grab a healthy lunch. It was a good way to cap off the 30-minute walk I took earlier that day. As a Midwestern gal at heart (Indiana born and raised), I love anything that has anything to do with pulled pork. So the BBQ pork with sweet potatoes and creamed spinach was a natural first pick. Everything—even the spinach—was delicious! And this is from someone who’s not normally a huge fan of cooked spinach. 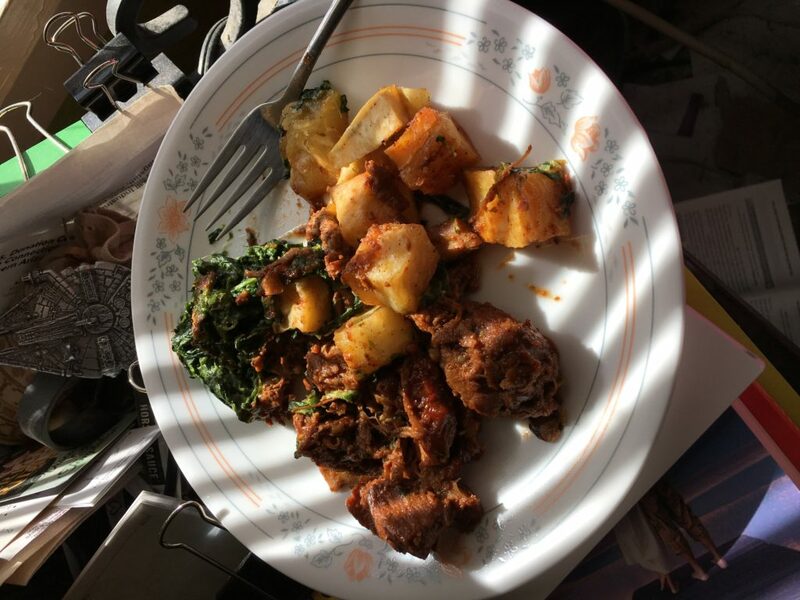 I’ve been known to say “give me raw spinach in a salad any day.” But this spinach had a good flavor—and tasted even better when eaten with a bite of potato and pork. 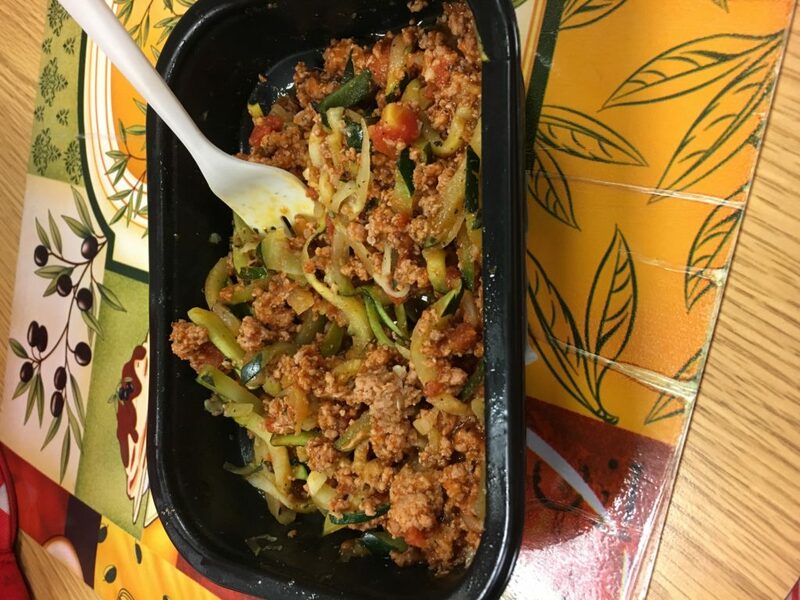 Dinner that night at work was the Paleo Spaghetti (above): zucchini noodles in house-made marinara sauce with ground turkey and fresh basil. Another home run. I love zoodles! Sure, they’re nothing like real pasta—but as someone who was on a low-carb diet for two years and is considering going back to it in the New Year, I can deal. After a few days of low-carb eating, I don’t even miss the pasta, bread, potatoes and ALL the sugary sweets. The Paleo Breakfast Hash (above) was my least favorite meal of the shipment. 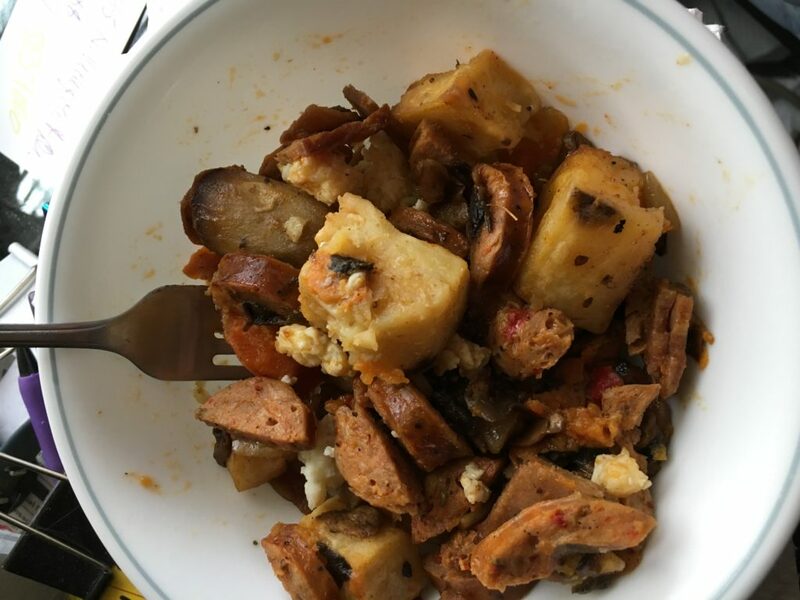 It sounded delicious in theory: all-natural chicken sausage, nitrate-free turkey bacon (okay, real bacon would be better), garnet and white sweet potatoes with mushrooms, local chiles, onion and garlic. 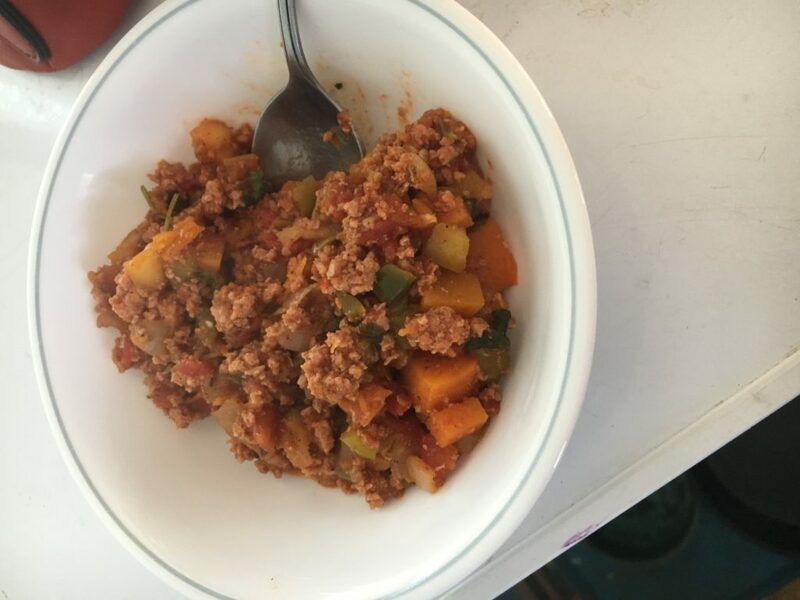 The Paleo Turkey Butternut Chili (above) might not look like much, at least when I’m taking its picture, but it was probably my favorite meal. It was on the company’s list of weekly specials, rather than the “Everyday Favorites” that are available all month long. It had great flavor (not too spicy) and was very filling. Plus, I love pretty much anything that involves butternut squash (or zucchini). For sure, FITzee meals made eating easier. There was no thinking about what to cook (or which drive-thru to hit up next). I could pull out a fresh, tasty meal, microwave it according to the directions and enjoy. I think it’s Gretchen Rubin who says decision-making is hard. Using up all your decision-making power on things like what to eat makes it harder to make the BIG decisions when the time comes. So FITzee meals are an easy way to NOT have to think about food. Another perk: There is, indeed, little cleanup required. I had to wash only the utensil I ate with and, if I was trying to be fancy, the plate or bowl I put it on. Sometimes a gal likes to eat off real plates, not little plastic trays. Right? FITzee offers a variety of meal plans and boxes that range in price from $48.51 (5 small meals in “the lunch box”) to $258.35 (21 medium-sized meals in the “All in with the Big Box” package). I have my eye on the Paleo Shepherd’s Pie and Winter Vegetable Scramble. Jose’s Carnitas Plate looks tasty, too, but with the word “spicy” in the description, it’s no doubt way too hot for my wimpy taste buds.